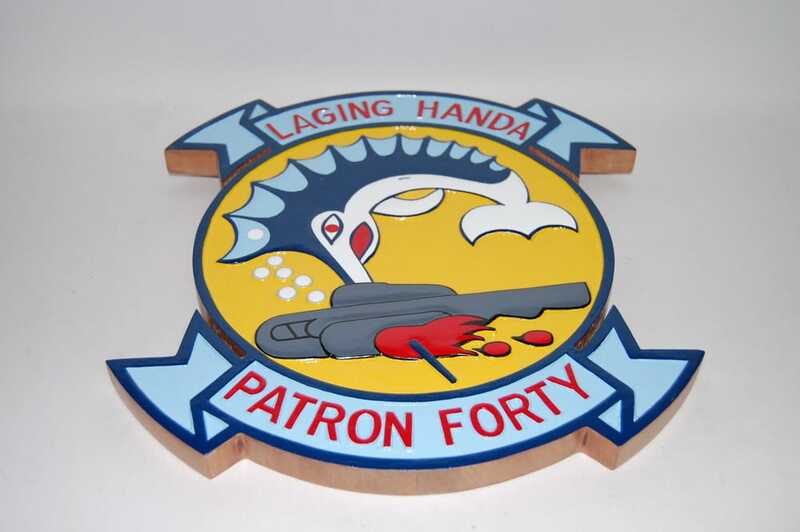 LAGING HANDA – Recreate your time with VP-40 in this Fighting Marlin plaque made from solid wood and meticulously painted to mirror the actual paint scheme of their logo. Size: 14 inches. *Our plaques are made from scratch, so we can modify accordingly. 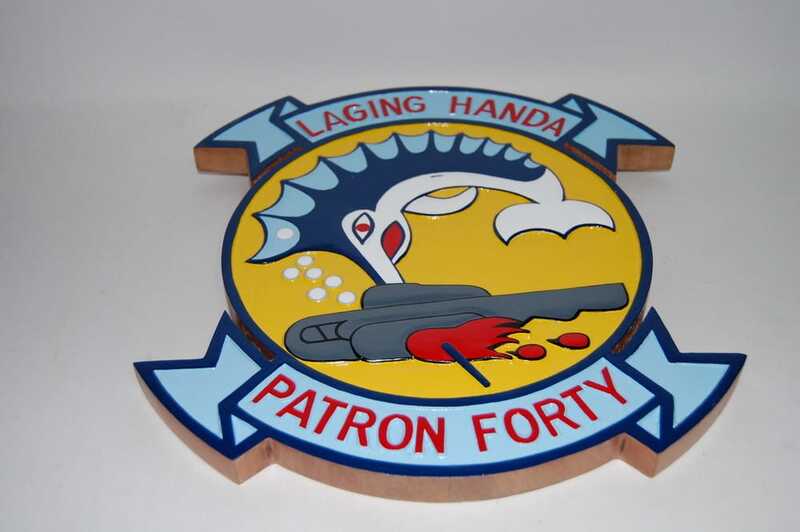 Patrol Squadron FORTY (VP-40) was commissioned on January 20, 1951, at NAS North Island, California. Following initial training in the PBM-5 Martin “Mariner” seaplane, the squadron marked the first of many WESTPAC operational deployments by departing for Japan in June 1951. 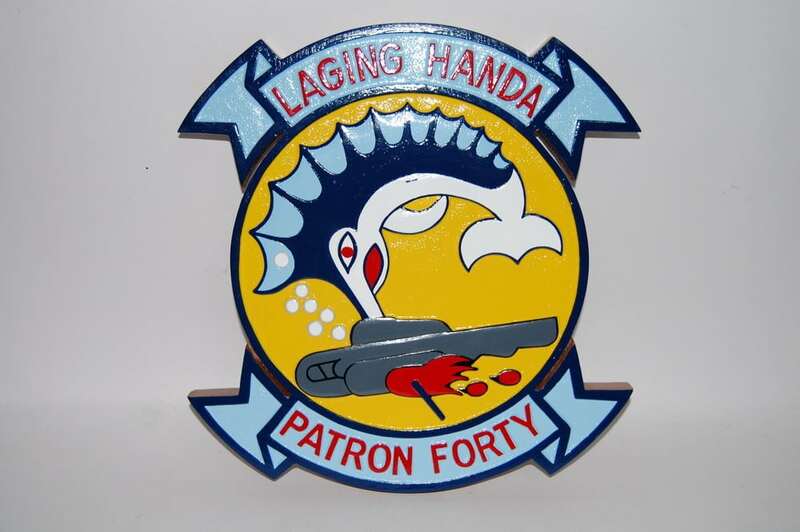 Operating out of Sangley Point, Philippines, VP-40 patrolled the waters surrounding the Philippine Islands until March 1953. Upon returning to San Diego, VP-40 became the first West Coast squadron to transition to the new Martin P5M-1 “Marlin,” and subsequently adopted the “Fighting Marlin” as its squadron symbol and nickname. In August 1959, VP-40 relocated its homeport for the first time, moving from San Diego, California, to Sangley Point, Philippines. 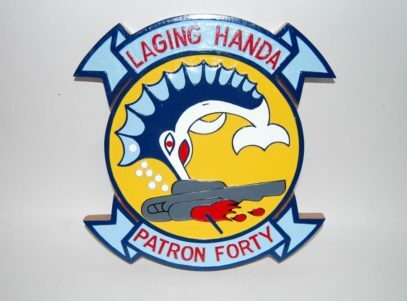 It was here that the Marlins assumed the motto “Laging Handa,” which, in the native Philippine language, means “Always Ready.” During the four years VP-40 spent based in the Philippines, the squadron upgraded to the Martin P5M-2, the U.S. Navy’s last operational seaplane. 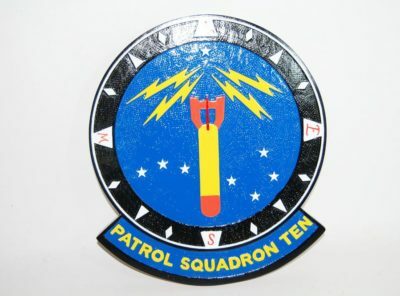 Over the next several years, Patrol Squadron FORTY conducted numerous deployments and operations from Sangley Point; this included support of Operation MARKET TIME in South Vietnam in February 1965. In May of 1967, the Fighting Marlins flew the last operational flight of a Navy Seaplane. 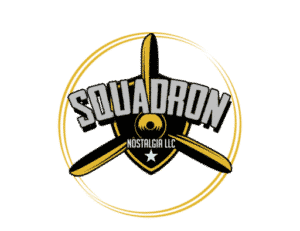 Later that year, the squadron returned its homeport to the United States, to NAS Moffett Field, CA, and began a transition to the land-based P-3B “Orion” aircraft. The Fighting Marlins made their first deployment with the P-3 aircraft in January 1968. Based at Marine Corps Air Station Iwakuni, Japan, Patrol Squadron FORTY flew patrols out of Cam Rahn Bay, Vietnam. 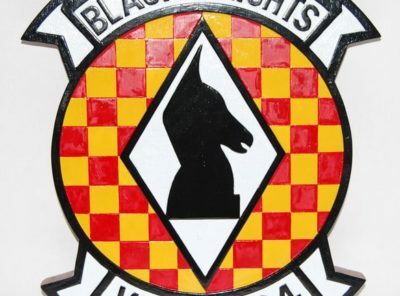 Throughout the 1970s, the squadron participated in numerous deployments to the Pacific Theater as well as detachments to Adak, Alaska. In the summer of 1975, VP-40 transitioned to the new P-3C aircraft. In 1977, the squadron introduced operational data link to the VP community on the West Coast. 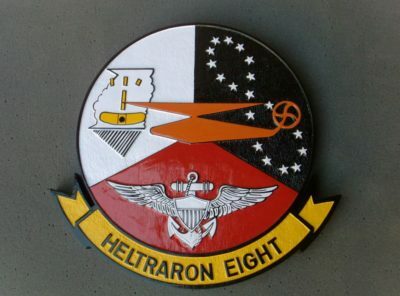 From July 1980 to December 1983, Patrol Squadron FORTY displayed exceptional proficiency throughout the course of three successful deployments to Misawa, Japan. While conducting operations in the Pacific Ocean, Indian Ocean, and the Arabian Sea, VP-40 amassed several awards, including back-to-back COMPATWINGSPAC “Golden Orion” Awards in 1981 and 1982, the CNO Aviation Safety Award for 1982, and a Meritorious Unit Commendation in 1983. In addition to its primary mission of maritime patrol, VP-40 also participated in Search and Rescue (SAR) operations in the Sea of Japan following the Soviet downing of a Korean commercial airliner in September 1983. 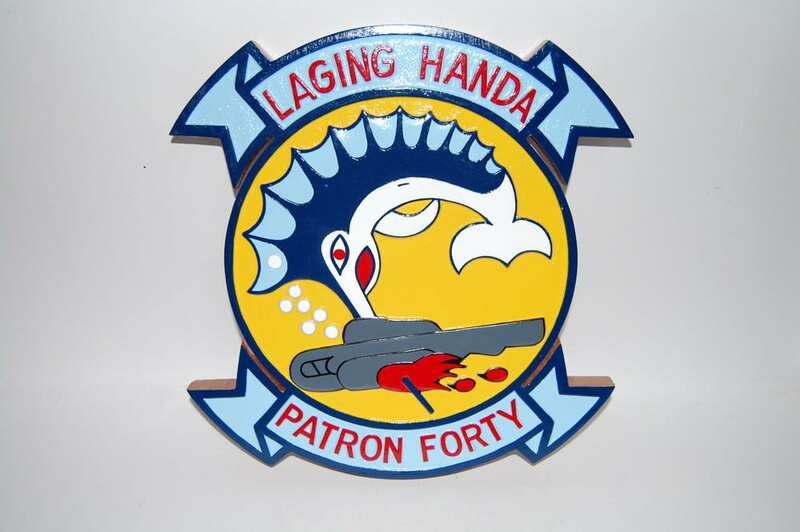 In October 1984, Patrol Squadron FORTY was chosen to represent the Pacific VP Fleet in an Atlantic/Pacific deployment swap program. Deploying to Keflavik Iceland, VP-40 crews operated from bases in Europe, Central America, Bermuda, and the Azores. After completion of the deployment, the squadron returned to Moffett Field and upgraded to the P-3C Update III aircraft—the Navy’s newest ASW platform at the time. Over the next decade, the Fighting Marlins operated from detachment sites around the globe and participated in the prosecution of the newest generation of Soviet submarines. In 1991, VP-40 bolstered the U.S.-led effort to liberate Kuwait during Operation DESERT STORM. During this time, the squadron continued to add to its outstanding record of achievement, claiming three Arnold J. Isbell awards, the Coastal Command Trophy, and two Golden Wrench Awards. In 1993 and 1994, VP-40 won consecutive Battle Efficiency awards. In 1993, Patrol Squadron FORTY left Moffett Field and moved up the coast to NAS Whidbey Island, the squadron’s current homeport. The ensuing years marked several more changes for VP-40 and the Maritime Patrol community. During a WESTPAC deployment in 1997, the Fighting Marlins upheld their mantra of “Always Ready,” proving adept at integrating new technology into their war-fighting arsenal. 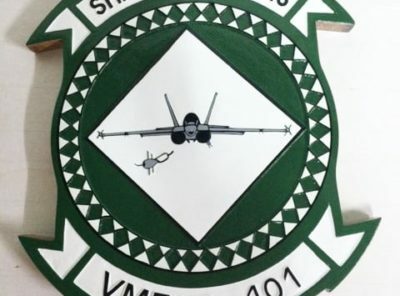 The squadron accepted the first AVX-1 electro-optical equipped CDU aircraft to be deployed to the SEVENTH Fleet, and they also participated in the first AGM-84E SLAM detachment to Qatar during a period of rising tensions between the United States and Iraq. From December 1998 to June 1999, VP-40 deployed to the Western Pacific and Persian Gulf in support of the FIFTH and SEVENTH Fleets under the operational control of CTF-72. 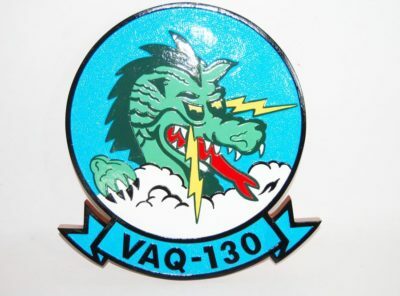 Participation in Exercises TANDEM THRUST and COBRA GOLD, as well as several successful SAR missions, helped earn VP-40 the 1999 Battle Efficiency Award. 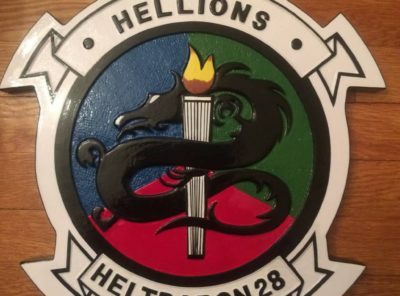 During the ensuing Inter-Deployment Training Cycle, Patrol Squadron FORTY took part in the most successful prosecution of a Russian submarine since the end of the Cold War. Among seven participating squadrons, Marlin crews flew 230 hours and accounted for over half of the total contact time logged.